A jury trial scheduled to begin Aug. 2 in a Hailey felony attempted strangulation case was cancelled on Monday after a plea agreement was reached. "It sounds to me that we have this resolved," Blaine County Deputy Prosecuting Attorney Matt Fredback said at a pretrial conference in 5th District Court for Ricardo Vargas-Hurtado. Fredback said that terms of a plea agreement include reducing the attempted strangulation charge to aggravated battery, also a felony. Vargas-Hurtado, 22, appeared in court for the brief hearing with Hailey attorney Cheri Hicks, who was appointed public defender. He remains in custody on $10,000 bond. An immigration detainer has been filed against Vargas-Hurtado by the federal Immigration and Customs Enforcement agency alleging that he is in the United States illegally. A change of plea hearing was scheduled for July 18. Hailey police reported earlier that Vargas-Hurtado was arrested on April 1 for allegedly choking his former girlfriend outside his home on Briarwood Drive in southeast Hailey. 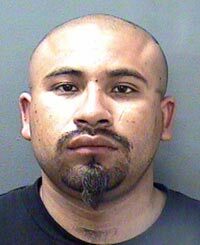 Vargas-Hurtado is also one of nine suspects indicted by a Blaine County grand jury on June 3 on felony drug charges. In an indictment, Vargas-Hurtado is charged with two counts of aiding and abetting delivery of methamphetamine for alleged participation in drug sales in August 2010 to a Blaine County Narcotics Enforcement Team confidential informant. Bond has been set at $100,000 in the drug case. The Roark Law Firm has been appointed public defender.